New official figures show that 325 people were killed and another 697 wounded across Iraq in July. 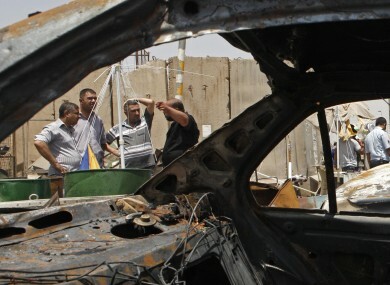 The scene of a car bomb explosion in Sadr City, Baghdad on 23 July. JULY WAS THE deadliest month in Iraq in almost two years, with 325 people killed in attacks, official figures released today show. The statistics compiled by the health, interior and defence ministries showed that 325 people – 241 civilians, 40 police and 44 soldiers – were killed nationwide during the month. Another 697 people – 480 civilians, 122 police and 95 soldiers – were wounded. It was the highest monthly toll given by the government since August 2010, when figures showed 426 people killed and 838 wounded in attacks. The previous highest official toll this year was for January, when government figures showed that 151 Iraqis were killed and 321 wounded in attacks. Government figures are usually lower than those given by other sources, but the July toll was higher than a tally kept by AFP based on reports from security and medical officials. According to the AFP tally, at least 278 people were killed and 683 wounded in July, down slightly from at least 282 fatalities in June. While violence has decreased from its peak in 2006-2007, attacks still remain near daily occurrences in Iraq. Email “Last month was Iraq's deadliest since August 2010”. Feedback on “Last month was Iraq's deadliest since August 2010”.